Clean the fish and drain all excess water add salt and turmeric, set aside. In a big non stick pan heat oil on medium flame add the peppercons and after 20 seconds, add the red chili and curry leaves and then the onions saute for a minute now add the garlic and let it cook until onions get translucent, this takes around 3 minutes. Now add the chopped tomato, green chilli saute until the tomoto turns mushy should take 3 minutes. Now add the masala powder (eastern masala) and little salt and mix well, add 1/4 cup water and let it the tomatoes cook further for 3 minutes until the oil separates. Check for spiciness and salt. Add 1 cup water and 1/2 cup tamarind water discarding the pulp and bring it to a boil and let it cook for 6 minutes, now add the marinated fish pieces and cover the lid, let it cook in medium flame until fish is cooked about 6-7 minutes. Now check if the fish is cooked now add the remaining tamarind water discarding the pulp, cover lid and let it cook further for 5 minutes. Serve hot with rice or idly or dosa. The curry tastes fabulous as the fish marinates in the curry for long. 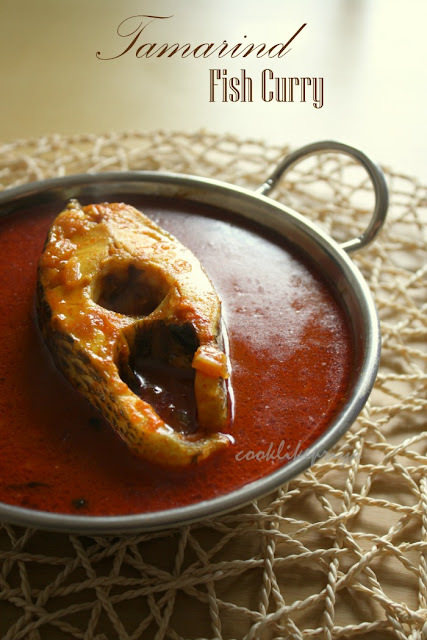 fish curry looks very tempting priya. Delicious fish curry Priya. Looks fiery and yum. 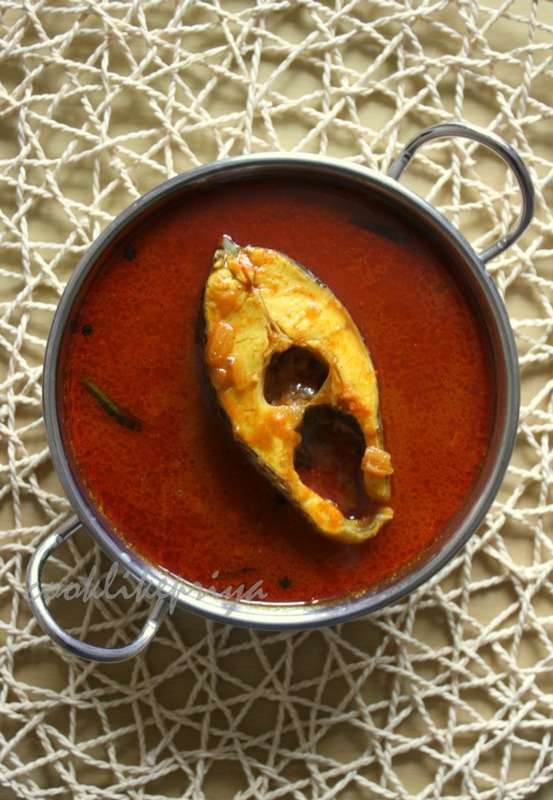 Tangy and yummy fish curry. Beautiful click. Trust me guys, this curry was simply fabulous, am so lucky to enjoy this fingerlicking fish curry with hot steaming idlis.Look at the colour of curry,who can resist to it. too hooot,to miss it.love to have it now.lovely clicks. truly tempting one...loving that colour..
like your last click very much priya :) it looks special to me.. love this curry with rice.. When I saw the curry I was thinking which fish it was,.oh I love tilapia !! We r fish lovers ,yummy yummy !! 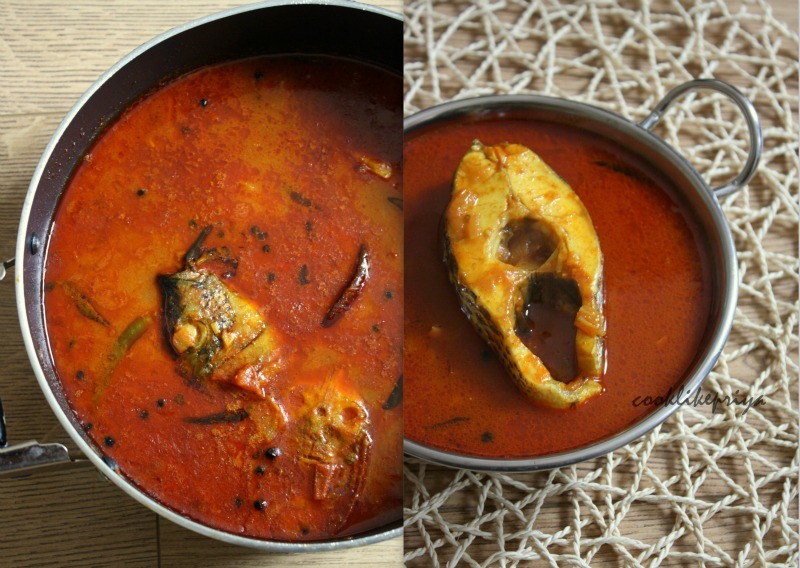 Fish curry looks so delicious and inviting! Finger licking good dear,I love it!! Amma's recipes are sure to be a success. Will send this link to my daughter. They love these tangy dishes. Gosh! what a tempting dish!! Your click makes it more mouthwatering!! Well no doubt Mom's recipe rocks, pics are amazing. Elegant, I'll try this after I'm done with baked wahoo fish recipes. And thanks for the recipe. Great job! I tried this today, delicious!